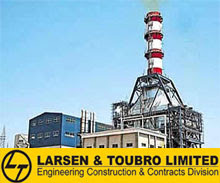 Larsen & Toubro Limited (L&T) is India's largest engineering and construction conglomerate with additional presence in electronics and IT. A strong customer-focus approach has enabled L&T to attain and sustain leadership position over last 50 years. L&T enjoys a premiere brand image in India and its international presence is on the upswing, with a global spread of over 30 offices worldwide. Recently L&T has increased its stake in IT company Satyam Computers from 4% to 15%. Will it have any major impact on its balance sheet? We have to wait and watch, till there is some clarity on the operations of Satyam Computers. Now let us take a look at the fundamentals of the L&T's stock. ..Order backlog up 48% to Rs.609 bn, equivalent to 30 months of FY08 sales. ..Best placed in emerging opportunities like Defence, Railways and Shipping. ..Downside risk to margins has diminished in view of softening in metal prices. ..Ability to tap opportunities in Middle East if domestic market slows down. ..Credit crunch and firming interest rates likely to decelerate infrastructure investment. ..Bad debts may increase as firming of interest rates and credit crunch impact project developers. ..Impact of its stake in Satyam. At CMP of Rs.630, the stock trades at 13 times FY09 earnings estimate of Rs.49.Medium to Long term investors can Buy/Accumulate on declines, to get good returns. Interesting Post! !L&T is considered a very safe stock.A huge asset for any portfolio. Can't seem to find ur email id.there is something i wanted to discuss with you regarding our common interests in stock markets.